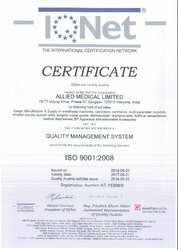 We, "Allied Medical Limited", established in 1982, an ISO 9001:2008 and ISO 13485:2003 certified company, are well-known Manufacturers, Exporters, Traders and Importers of a huge gamut of Hospital Equipment. Under this brand name, we offer Anaesthesia Machines, Anaesthesia Workstations, Anaesthesia Ventilator, Anaesthesia Vaporizers and much more. We have shaken hands with our renowned vendors Meditec International England Ltd. for strategic and technical collaboration. We are backed by a state-of-the-art infrastructural unit that covers a vast area and is equipped with latest machines, production methods, and tools to manufacture bulk quantities of products in a streamlined manner. Our departments are fully equipped with modern amenities for enabling smooth operations. We are supported by an adroit team of professionals, which always tries to develop innovative equipment. We follow all required pharma norms and have implemented total quality management. We are engaged in some major projects like Sri Sathya Sai Inst. of Higher Medical Sciences, Puttaparthi and Sri Ramachandra Medical College, Chennai, AIIMS, LNJPN Hospital and R&R (Army) Hospital. Our core expertise and extraordinary resources have led us to serve some well-known clients like Safdarjung Hospital, LNJP, R & R Hospital and much more. Our company has been experiencing a tremendous growth path of success for more than one decade with the major contribution of our director Mr. Aditya Kohli. Under his insightful consultancy and visionary leadership, we have been able to carve a niche in the industry. We are backed by a sound infrastructural base that is equipped with a range of well-developed research & processing tools that allow efficient & reliable operations. All units at our facility are accommodated with latest technology based tools and machineries like CNC lathe, VMC milling and many others. Moreover, our spacious warehousing unit is fully compatible with all modern equipments for ensuring the storage and arrangement of equipments in a safe and reliable manner. We are an ISO 9001:2008 Certificate certificate company and are reckoned in the respective domain for sticking to the international quality standards throughout the production process. We believe that our exceptional progress has only been possible owing to the outstanding contribution and sincere involvement of our workforce. Thereby, we hire highly skilled and experienced professionals who are experts in their specific domains. They continuously put their best efforts into the development of utmost quality equipment. Moreover, our professionals always have been focused on keeping themselves updated with the prevailing trends, research and technological advancement in this domain. Being a quality oriented firm, we always try to provide utmost quality machinery to win the trust of our clientele. Thereby, we strictly focus on following international standards of quality from processing to packaging by conducting a rigorous inspection on various parameters to ensure optimum quality for our products. Moreover, total quality management standards followed by us enable us to maintain standards for our machines in accordance with the pharma industry laid guidelines. Apart from this, we use only first-grade materials in our manufacturing process. Since our establishment, we possess rich domain excellence and have consistently endeavored to cater to the clients’ requirements in the best possible manner. The company has a team of the skilled workforce, which strives to develop high-quality medico equipment. Our logistics professionals are engaged in providing timely shipment of the products to the clients based across various sectors. Our sincere workmanship and progressive business policies have helped us to establish sound business relationships. Since its inception in 1982, Allied Medical Limited (AML) under the guidance of its founder Dr. Vinod Kohli (MBBS, FFARCS) an eminent anesthesiologist with an experience of over 40 years in the field of anaesthesia has marked its presence in the Healthcare Industry as a leading manufacturer, exporter and importer of Anaesthesia, Operation Theatre, Intensive Care and Emergency equipment. AML was established with an aim to deliver advanced yet cost effective medical solutions. AML is an ISO 9001, ISO 13485 accredited company for last more than 10 years and a majority of the products manufactured are in line with global standards and have European CE certification. The company has its facilities at Udyog Vihar, Gurgaon with close to 1,00,000 sq. ft. clean, area housing a well-developed manufacturing and service centre and a strong and dedicated research & development division, recognized by the Ministry of Science & Technology (Government of India) that focuses on using new and existing technologies to develop innovative solutions that answer today’s healthcare needs.